There are many advantages to cooking on a wood grill fire pit. The real firewood smoke is second to none in flavoring your foods. The die-hard outdoor cooker swears by fire pit cooking. However, cooking on a fire pit is not exactly the same as cooking on your charcoal or gas grill. There are many similarities but there are some differences that must be accounted for and adjusted for. The more you work with real wood fires and cook on a firepit, the more you'll learn. But here are a few tips to get you going that I've found useful in my wood grill cooking. Types of Firewood to Use - For barbecue pit cooking on a firepit you want a seasoned (dried) hardwood. This will burn hotter and longer than softwoods (pine, spruce, etc.). Also, you want to avoid those really resinous woods like pine because, while they smell nice, they can put off some strong piney aromas that aren't the best for your food. I love to use fruit and nut woods like cooking with apple wood, almond wood, or cherry wood. Other excellent options are oak and hickory. You can also add distinct flavors by adding water-soaked smoking wood chips or chunks like mesquite or hickory even if you are using other less flavorful woods for heat. For more information on firewood and the best firewoods for cooking and other uses, see our firewood section. Starting Your Fire - Starting a wood fire is not like starting charcoal and certainly not like using a gas grill. I try to avoid starting my fire with any chemical fire starters when I am going to cook over it. This kind of fire starting is more similar to starting a fire in your fireplace. I like to use either fatwood fire starter kindling to get my firewood lit. Alternatively, if you have some charcoal handy, you can start up a chimney full of charcoal and use those embers to get your firewood started. For other firewood lighting ideas and tips, see my fire starter page. 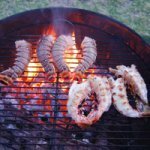 Grill on Hot Embers, Not Directly on Open Flames - One mistake people often make when first cooking on a wood grill is putting their food on too early. If you put food directly over a large flame (as you get with an early fire when the wood is still actively burning) it will catch fire and the outside will char. While caramelized, browned food enhances the flavors of your raw ingredients, charred food tastes horrible. Its like eating charcoal. Ideally, you want to be cooking over wood embers, not directly on wood flames. To do this, start your fire early and be sure you have enough firewood handy. Get a nice big bonfire going in your wood grill, bigger than you'd think you'll need. It is ok if the wood is pilled up and there is no room to put the grill grate on. Wait! As the wood burns, it becomes charcoal-ized, turning to red-hot, glowing embers. The wood will fall apart into the bottom of your fire pit. The embers are actually hotter than the initial fire. They are what you want to cook on ideally, not the initial wood fire. Keep burning wood until you have a nice bed of glowing embers. Only then should you add your grill grate and start cooking. But still be careful, just like with a charcoal or gas barbecue, you can get flare ups which will char your food quickly if you don't attend to your food closely. By the way, once you are done cooking, if you want to keep your fire going for warmth, ambiance or to cook another course later (like s'mores for dessert! ), just throw a few more wood logs on the hot embers after you take the grill off. They should catch and burn in no time on those glowing embers, even if there is no open flame. Indirect Heat - One way to avoid flare ups and avoid food charing too quickly is to use indirect heat cooking on your wood grill. Indirect heat means you are letting the ambient convection of hot air and smoke cook your food rather than direct flames. To try this, you ideally will need a solid lid for your fire pit to keep in your heat. Push your embers to one size of the fire pit and put your food on the other side and cover it. Food will cook slower this way. 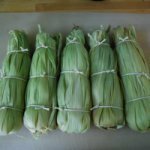 It is ideal for large roasts that you don't want to burn on the outside before the inside is done. If you want to keep your heat going for a long time and you are worried that the embers will get cooler and eventually die, you can keep adding wood on one side of the wood grill while cooking on the other. Most fire pit grills have a hinged size so that you can tend to your fire or add wood while grilling. Simply push coals under the grill where you want them while adding new wood on the other side, so that the flames of the new burning wood are away from the cooking food. If you cover the pit then that heat from the fire as well as the embers will be trapped and your food will roast nicely. For more information on the differences of indirect heat and direct heat grilling, they are discussed more on our page covering different types of barbecue cooking. Solid Lid - Most fire pit wood grills do not come with a solid lid. A solid lid can be very useful to keep heat around your food. This may not be important for direct heat cooking like searing steaks or hot dogs, but it is critical for slower indirect heat roasting of larger items like whole poultry, racks of ribs or leg of lamb. Fire pits usually come with a mesh screen guard that stops flying embers. If your fire pit grill is on the smaller side, like some portable ones, you may be able to use a barbecue dome lid. If your firepit is larger, you may have to improvise something or buy a large lid. One alternative is to use the screen mesh lid that came with your fire pit. 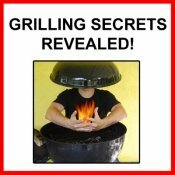 It may not seem like it at first, since it has holes right through it, but it actually does contain some of the heat inside your barbecue pit. Rotisserie - Another way to improve your cooking of larger roasts is to build or buy a rotisserie attachment for your fire pit. A rotisserie allows for very even cooking and succulent, juicy results. There are several motorized rotisserie attachments for grills which could be adapted for a fire pit. There are some fire pits with specifically designed motorized rotisseries available for them, such as the California Fire Pit and the Sojoe Fire Pit. Tarp Cover - Most wood grill fire pits do not come with a tarp cover to protect it from water, rain and whatever else your weather can throw at it. If you are going to keep your fire pit outdoors year-round you should definitely get a water-proof cloth or plastic tarp cover to protect your investment! It will keep your wood grill cleaner and it will prevent rusting and corrosion, giving you many more years of barbecue pit cooking than if you let the ravages of nature have its way with it. If you cannot find one made specifically for a fire pit, large grill covers which can be bought anywhere grills are sold will usually work fine. Remember not to put your tarp over your fire pit until the fire and all the hot embers are extinguished and cool. The embers can stay very hot for quite a long time, even overnight! You don't want your cover (or anything else) going up in flames! Ready to cook up a great meal on your wood grill fire pit? 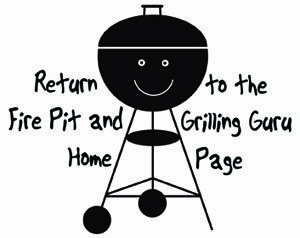 Check out some of our grilling recipes. Go back to our wood grill Fire Pit Cooking page.